The cast of Quartet are deep into rehearsals, and word on the street is this one is going to be a show to remember. However, we have a request for help. All productions rely on the support of a backstage crew; we need volunteers to work backstage. It promises to be a fun and productive experience. If you have any of these that you’re willing to lend for the duration of the production of Quartet or you would like to volunteer backstage (the play shows at the Masque from 10–18 October), please contact Faeron Wheeler, prod sec, on faerie452@gmail.com. Next members evening is 3 October. Liz has recruited some budding directors to show us what they got. There will be a showing of new directors’ work followed by a Q&A session. If you are still interested in showcasing your talents as a director, feel free to contact Liz Roodt, our multi-talented members evening coordinator, on lizroodt@yahoo.co.uk or 081 259 3607. Please come and support the new talent and share your acquired wisdom with them. 18 – 27 Sept Cat on a Hot Tin Roof by Tennessee Williams, directed by Barrie Howard and presented by Constantia Theatre Players at the Masque. This production has all the earmarks of Williams unique dramas, involving emotionally biographical themes of ambivalence in sexual orientation, disaffection and difficulty in maintaining intimate relationships. The play concerns a young man’s disgust with mendacity and descent into alcoholism following the death of his college friend, and his wife’s efforts to stop him drinking so that he can take over his dying father’s plantation. This play won Williams his third New York Drama Critics Award and his second Pulitzer Prize and was his personal favourite of all his plays. Tickets from R60. 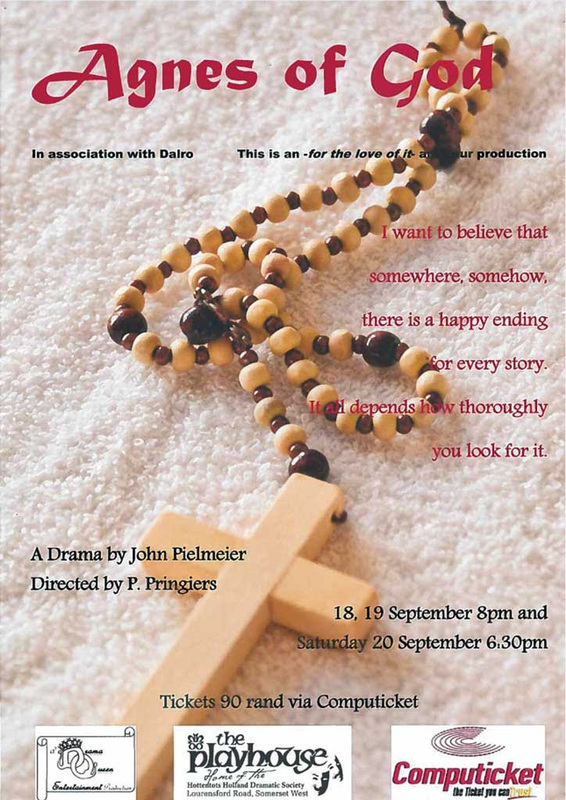 18 – 20 Sept Agnes of God, a drama by John Pielmeieron, presented by DQ Productions at the Playhouse, Somerset West. This is a new drama group started in Gordon’s Bay and the play is directed by P. Pringiers. “I want to believe that somewhere, somehow, there is a happy ending for every story. It all depends how thoroughly you look for it.” Tickets R90 through Computicket. 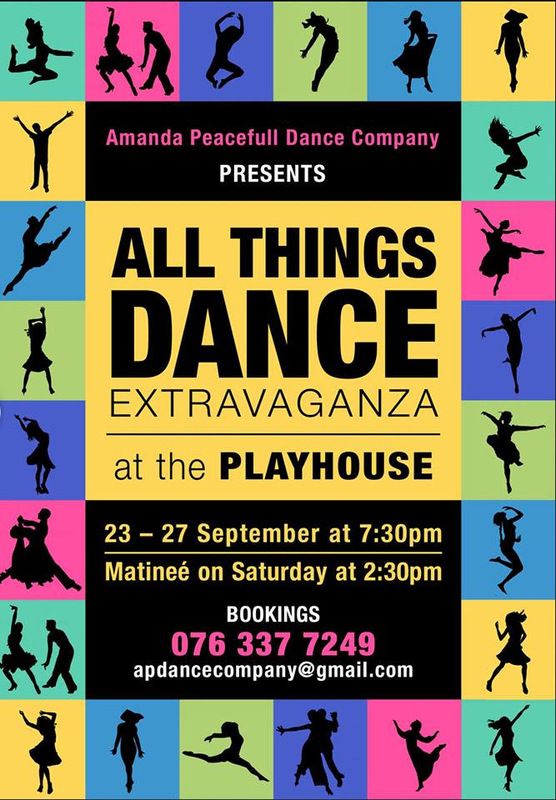 23 – 27 Sept All Things Dance presented by the Amanda Peaceful Dance Company at the Playhouse, Somerset West. Further info and bookings on 076 337 7246. 3 – 18 Oct Breaking Up is Hard to Do, the South African premiere of the musical featuring the songs of Neil Sedaka, directed by June Wells for Pinelands Players. Musical direction by Alan Van der Merwe and Ted Faulkner with choreography by Brendon Van Blerk. This fun musical is on at the Magnet Theatre in Observatory and you can phone 060 930 4961 to book or visit pinelandsplayers@gmail.com. Feel free to sing along to “Calendar Girl”, “Stupid Cupid’, “Solitaire”, “Laughter in the Rain”, “Happy Birthday Sweet 16” and many other toe-tapping numbers! Let your hair down and dance in the aisles! Tickets cost R130 and R100 for matinees. All bookings must be paid for before being confirmed. The referendum on whether Scotland should be an independent country will take place on Thursday, 18 September 2014. During the debate an article appeared in the Guardian newspaper listing apologies to Scotland on behalf of England, covering everything from the Highland Clearances to digs at Susan Boyle. So, of course, Scottish papers responded in kind! And just to show that I have NO bias WHATSOEVER, I’ve given you both sides. So look out for some interesting “bits” in between all the other news!! A useful way of enjoying West End theatre at only 10 pounds is to go, or phone early, for a Wednesday matinee. Two plays packing them in are both Arthur Miller vehicles. At The Old Vic is a visceral re-imagining of The Crucible. It’s running now, adapted and set in South Africa by internationally acclaimed SA writer and director Yael Farber- featuring Bongile Mantsai and Hilda Cronje. It’s part of Kevin Spacey’s 10th anniversary in the round at The Old Vic. And at The Young Vic, another Arthur Miller play A view from the Bridge. This theatre proudly runs ‘Taking Part’ a project for local communities and young people to appear on stage with professionals. Meanwhile, pub theatre is going great guns with the ‘Permanently Bard Company’ sponsored by Fullers Brewery, touring pub gardens in the South of England. They are currently on at my local Twickenham pub, The Turks Head, with A Midsummer Night’s Dream. England says: Sorry that some of us lift your kilts up at weddings. You know, to check. That’s not on. Scotland says: Sorry for never failing to remind Union-Jack waving sports fans that athletes such as Christine Hoy and Andy Murray are actually Scottish. Tamara-Lee Wannenberg, a speech and drama teacher from Tokai. England says: Sorry for David Cameron stressing his Scottish ancestry to belatedly ingratiate himself with you. Even we thought that was embarrassing. Scotland says: Sorry for consistently producing the funniest folk on the planet: Billy Connolly, Craig Ferguson, Ronnie Corbett, Kevin Bridges, Stanley Baxter, etc. A teeny-tiny crop of birthdays in September – but a lot more than we had in 2009 when the only ones were Aubrey and Celia!! Debra Beswick starts us off on the 11th, followed by Patrick Jordi on the 16th. Aubrey Hindle celebrates his birthday on the 20th with Nikita McShane following on the 23rd. We round out the month with Celia Musikanth on the 29th. And to my great surprise I have never delved into September’s birthstone! The traditional birthstone is the Sapphire which is associated with truth, sincerity and constancy. The traditional colour of the Sapphire is a deep blue and this is strongly favoured as a popular gem in jewellery. However, Sapphires can be found in a variety of colours, including yellow, pink and white and different shades of blue. Sapphires with colours other than blue are generally referred to as fancy sapphires. Wishing you all a great year ahead! For the London apartment – a couch or chaise and some easy chairs upholstered in black, white or grey or a mixture, plus a fairly ornate-looking wooden dining-room table (does not have to be very large), 3 chairs and a coffee table. For the garden of a country estate – a garden table and 3 chairs that need to look like ‘wrought iron’ (can be a synthetic version) and two larger, comfortable wicker/basket-work garden chairs. These would be needed from Thurs 30 Oct to Sun 16 Nov. Contact barbara.basel@gmail.com if you can help. If you have any of these that you’re willing to lend for the duration of their production of Quartet (at the Masque 10 – 18 Oct) please contact Faeron Wheeler, prod sec, on faerie452@gmail.com. Thurs & Fri performances at 20:00, Saturday matinee at 14:30, Saturday evening at 18:30. 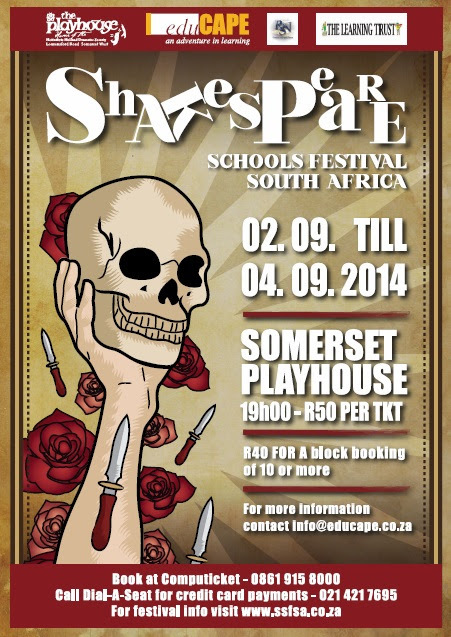 Thurs eve and Sat Matinees R60 (Theatre Club members R50). Other Nights R70 (TCM R60). Cat on a Hot Tin Roof by Tennessee Williams, directed by Barrie Howard and presented by Constantia Theatre Players at the Masque. This production has all the earmarks of Williams unique dramas, involving as it does, his emotionally biographical themes of ambivalence in sexual orientation, disaffection and difficulty in maintaining intimate relationships. The play concerns a young man’s disgust with mendacity and descent into alcoholism following the death of his college friend, and his wife Maggie the Cat’s efforts to stop him drinking so that he can take over his dying father’s plantation. This play won Williams his third New York Drama Critics Award and his second Pulitzer Prize and was considered his personal favourite of all his plays. Tickets from R60. Agnes of God, a drama by John Pielmeieron, presented by DQ Productions at the Play-house, Somerset West. This is a new drama group started in Gordon’s Bay and the play is directed by P. Pringiers. “I want to believe that somewhere, somehow, there is a happy ending for every story. It all depends how thoroughly you look for it.” Tickets R90 through Computicket. The World Goes Round, the Songs of Kander & Ebb, directed by Sheila McCormick and presented by Milnerton Players at their Playhouse. This fast moving revue consists of an eclectic collection of love songs, torch songs and acerbicly witty comic numbers, some well-known and some not so well-known, from some fourteen Broadway shows such as New York, New York, Chicago and Cabaret. This cast of five talented and seasoned musical theatre performers cope with quick changes of costume and mood while adroitly handling difficult harmonies under the expert musical direction of Jeremy Quickfall. Book on 0822671061 or www.milnertonplayers.com. Tickets R90 evenings and R80 matinees. Dynamite Music will be hosting another classical cd/dvd expo on the Masque Veranda from 10h30 till 19h00. Dynamite Music is the only importers that bring in classical products which they sell direct to the public. So for all music lovers from Muizenberg to Simonstown and surroundings…if you love classical music, this is your chance to browse through South Africa’s largest selection of classical music. All Things Dance presented by the Amanda Peaceful Dance Company at the Playhouse, Somerset West. Further info and bookings on 0763377246. Breaking Up is Hard to Do, the South African Premiere of the musical featuring the songs of Neil Sedaka, directed by June Wells for Pinelands Players. Musical direction by Alan Van der Merwe and Ted Faulkner with choreography by Brendon Van Blerk. This fun musical is on at The Magnet Theatre in Observatory and you can phone 0609304961 to book or visit pinelandsplayers@gmail.com. Feel free to sing along to “Calendar Girl”, “Stupid Cupid’, “Solitaire”, “Laughter in the Rain”, “Happy Birthday Sweet 16” and many other toe-tapping numbers! Let your hair down and dance in the aisles! Tickets cost R130 and R100 for matinees. All bookings must be paid for before being confirmed. Wednesday, 17 September, at the Rendezvous. I know we are already in spring but I’m sure there’s still some cold weather to come! So this is going to be our soup-and-bread evening. Those of you who have attended before know that this is always a very special treat! Our little cash bar will of course be open but you are welcome to BYO – we’ll supply glasses and ice. We’re going to be something fairly challenging this time round – spontaneous speaking – which should also be lots of fun! Here’s how it will work: there will be a “receptacle” with various (single) words on pieces of paper. If you would like to participate you grab one and then at some time during the evening you will be called upon to speak about “your word” – you can sing, say a poem, give your experience, explain it, whatever!! We are molly-coddling you a bit in that you WILL have some time to think about it!! For catering purposes we do need a head-count so please RSVP to Wendy Morling on home@morling.co.za or 7150694 or 0834628242 by Friday 12 September. Scotland says: Sorry for eternally gloating at having provided cinema with the best Bond ever (it’s true though). England says: Sorry for blaming you for Tony Blair. Yes, he is Scottish, but we voted for him. Nico Dreyer is appealing to the Masque Societies for someone to volunteer to help him put up posters in the foyer (a job that Wendy Goddard used to do). Please contact him on 021 7886999 or nico@masquetheatre.co.za if you can help. Please see below for details of The Masque Supporters’ Clubs!! The Cape Town G&S Society is holding auditions on Saturday, 13 September at 13h30 for all those interested in participating in the Viva Voce programme over the next 12 months. It will be held in Rehearsal Room 308 at Artscape. Viva Voce is an arm of the Society where participants can experience G&S operas and musicals in any form of vocal ensemble. This may take the form of either an informal or formal gathering. Performers for specific concerts will be selected from the broader group depending on availability, available rehearsal time and voice parts required. For further info visit www.gilbertandsullivan.co.za or email Email Philippa van Ryneveld at auditions@gands.co.za. Scotland says: Sorry that Scotland is THE place to be this year with the Commowealth Games, Ryder Cup, Bannockburn Celebrations, MTV Awards. But you’re welcome to join us! England says: So very sorry for taking so long to say sorry. But look. Tell us what you’d need to stay. A no-peeking-under-the-kilt law? Done. A 25-0 start in future rugby internationals? Nae bother. Let’s talk. Anything is possible. Except you going. We couldn’t bear that. Hope to see you all on the 17th!! As most of you know, we have just replaced the entire roof of the theatre, but now we also need to replace the air-conditioning system before the heat of summer; as well as on-going maintenance of the stage mechanics, fire-proofing and all the other things that need to be done to ensure that the theatre – your theatre – is kept in a safe and comfortable condition for everyone who uses it. The Masque does not have a reserve of funds to cover these costs so we need to ask YOU, our loyal supporters, to help us – as every theatre across the world has to ask its supporters. At our AGM in May we decided to launch two new Masque Supporters Clubs based on the very successful clubs run by St Luke’s Hospice and a number of other charities. The Masque 200/50 Club will be made up of 200 ‘angels’ who each donate R50 a month, by debit order or R600 per annum by cheque or direct deposit to The Masque Theatre account. They will each be given a membership number. The Masque 200/100 Cub will be made up of 200 other ‘angels’ who donate R100 a month or R1 200 per annum. They will also receive membership numbers. Every month there will be a draw in which 2 membership numbers from each club will be randomly selected to receive complimentary tickets to The Masque Theatre productions. For the 200/100 Club the First Draw will be 6 tickets and the Second Draw will be 4 tickets. For the 200/50 Club the First Draw will be 4 tickets and the Second Draw will be 2 tickets. These tickets will be able to be used to reserve seats for any shows at The Masque, including outside productions, as long as the show is not sold out and the producer agrees. (There will be a maximum of 8 seats per show allocated to Club members) The complimentary Club tickets must be used within 3 months of being issued. In addition there will an annual Masque 200 Club function to recognise and thank all the members and a Masque 200 Club board will be put up in the foyer with the names of all the contributors. So if you love The Masque too, and are in a position to make a monthly donation towards the costs needed to keep it going, please contact out theatre manager Nico Dreyer on 021 788 6999 who will be delighted to add your name to one of the Masque Supporters Club lists. THANK YOU for your continued support of this great little theatre. The first half of October 2014 sees the first formal Muizenberg Festival! The Festival is a celebration of Muizenberg’s commitment to creative, collaborative, community-led transformation and is an opportunity to maximise the resources, connections, talents, skills and collective power of the community. Activities will take place throughout the whole month, but the high point is the week ending the 11th & 12th of October, with a variety of exciting events, culminating in a fabulous weekend of activities. Music concerts, theatre, exhibitions, and the like. The full programme is due to be released shortly, but we can reveal that MADS will have a presence – Barabara Basel, director of the upcoming MADS show at the Masque Theatre, The Importance of Being Earnest, has agreed to open up one night’s rehearsal to the public, and to host a Q & A session afterwards. The rehearsals are held at the False Bay Rendezvous where our MADS members’ evenings are held, and the open session will be at 19h30 on Wednesday, 8 October. Donations will be accepted and these will be used towards the upkeep of the Masque Theatre. On Mon 6th & Tue 7th, at 8pm, MADS member Raymond Rudolph will be performing the one-man show, Hovering, which he produced at the National Arts Festival in Grahamstown this year. Written by UK writer Ron Aldridge, adapted for South Africa by Raymond , and directed by Celia Musikanth, it will be staged at the Alive Cafe Creative Experience Hub, a lovely intimate venue at 11 Atlantic Road, close to the railway bridge. Billed as a seriously funny comedy, it runs for an hour and is rated PG13, so teenagers may have to explain certain things which their parents may not understand. Kaiser Chiefs, dentists, waiting, the afterlife – random thoughts of a man waiting in hospital for news of his comatose wife, hovering between life & death. Why is he waiting? Is there more to him than meets the eye? A hauntingly funny piece of theatre, teetering on the border between laughter & tears. “With a lot of mind picking and thought-provoking messages this performance is targeted at an adult audience. A wonderful experience.” (Cue Review, Grahamstown 2014). Tickets are R50 and part of the proceeds will be donated to the Festival in aid of local projects. Contact Raymond at raymrud@netactive.co.za or 082 3122 737 for info. We’ve heard rumours that well known local muso’s, Steve Newman (guitar), and Chris Tokalon (Sax & flute) may also be doing gigs. Details to be confirmed! For more info please check out the official Festival website: www.muizenbergfestival.co.za, or the Facebook page. For info on the above two events, click on the “Projects” link on the Festival site, and then on the green-circus-tent “Celebrate Muizenberg” icon. For info on Alive Cafe Creative Hub please check out www.alivecafe.co.za. If you are a wonderfully creative and talented individual, as most of our MADS members are, there is an opportunity for you too to take part in the Festival. The coordinator of informal events at the Festival, Robyn Wainwright, is looking for people who’d like to perform street theatre on sidewalks or sing or dance or play music, or simply walk around in wacky, bizarre, colourful costumes, interacting with people and generally creating a vibe. Phone Robyn on 0723118442 or email her at reconnectingtolight@gmail.com if you are interested or have any suggestions. There is no remuneration involved but you’ll certainly have fun. Or you can contact the Festival Manager, Fergus Turner, on muizenbergfestival2014@gmail.com. We have had a very busy period during August and September is also is also going to be hectic. We open the month with the School Shakespeare Festival on the 2nd, 3rd and 4th, there are 6 schools taking part, with 2 shows each night. This is being run in conjunction with Educape and The Learning Trust. Participating GET 40 MINUTE to present their abbreviated version of the play selected. This promises to be a great deal of fun and is an excellent way of promoting interest in Shakespeare. Tickets are only R50.00. Please come and support this wonderful initiative. 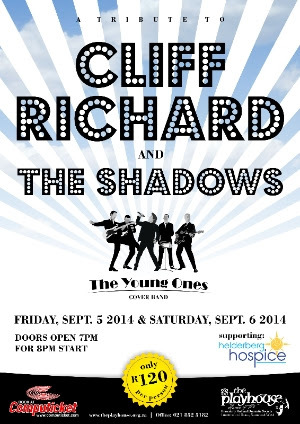 This is followed by another tribute to Cliff Richard and the shadows present by “The Young Ones” on the 5th and 6th September. DQ Productions present “Agnes of God on the 18th, 19th and20th September. This is a new drama group started in Gordon’s Bay. The play is directed by P. Pringiers. Next will be “All Things Dance” presented by the Amanda Peaceful Dance Company from23rd to the 27th September. Amanda is handling her own bookings so please contact her on 076 337 7246. On the 9th and 10 the October we present MIKE MCCULAGH’S “Tribute to Abba”. This show has been a sell-out wherever it has been. R5 from every ticket sold will go to Hospice. Gail Hattingh takes over the theatre in October for one of her spectacular dance shows. Fawlty Towers has been cast and is in Rehearsal. From reports received this going to be an excellent production this commences end November. We are in negotiation to bring Johan Liebenberg’s Tribute to Neil Diamond to the theatre early November..
We have the annual Director’s forum on Sunday 7TH September. This is when we begin to plan the production plan for 2015. For details please contact Darryl Spijkers. Lastly CONGRATULATIONS TO Antoinette on her very successful show “JUMANJI”. This was her first production as a teacher and she did extremely well. That’s it for this month. It was sad to hear that Ron Senyard has passed away recently in Pretoria. Ron was a member from 1970 to 1988 and was responsible for setting up the theatre lighting and sound box. We were sad to say good bye to Bettina Horvath who has returned to Austria. News from her is that whilst life is a little hectic, they are settling down nicely. As a result the Marketing Portfolio is being handled by Ann Coetzee, Clyde Phillips and Daneel Van Wyk. If you want to hire the theatre for next year this is the time to book it.